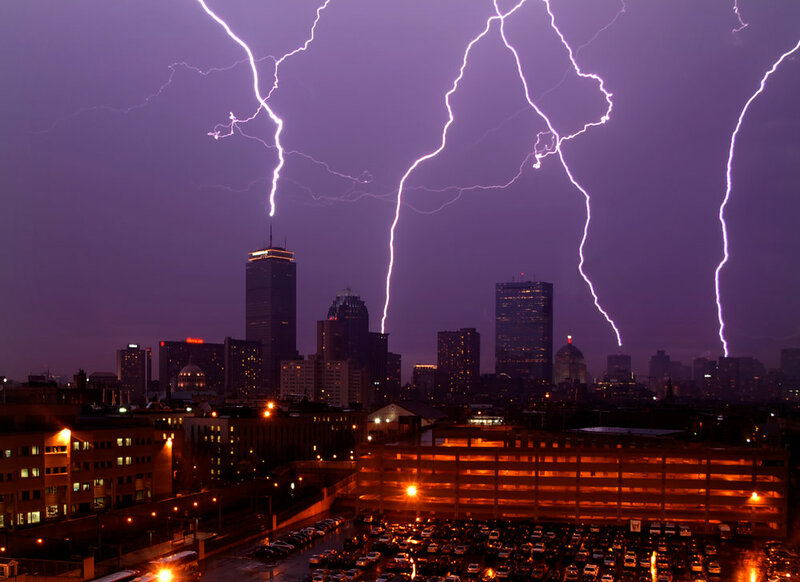 Today is the 10th year anniversary of one of my favorite photos I've ever taken, simply titled "Boston Lightning." It's an easy date to remember because it was taken on my sister's 18th birthday (happy 28th birthday, Kelly) and five days before my 20th birthday (...oh no). I thought it would be fun to relive the moments leading up to this picture, and describe how I got it. I still lived on campus at Northeastern University in early 2008. I got home from work (on a Saturday!) at about 6 PM, and I noticed two things. First: the sunset setup looked pretty nice. Second: there were some pretty foreboding clouds visible on the horizon. When I set off on this photo shoot, I had no intention of photographing a thunderstorm. I just wanted a pretty sunset, ideally with the skyline in front of it. There was a nice skyline view about a 10 minute walk from my apartment, from a parking garage that served Northeastern's campus. I had taken pictures from there before, though none for about a year leading up to this moment. I don't think I'd like the composition from this viewpoint much now, at least with the foreground visible here. But at least it was high enough up to get a clear view of the buildings. This view does not exist anymore, the parking lot in the foreground is where the new Northeastern College of Engineering building is now located. Anyways, sunset came and went. I got some good color in a direction I wasn't very interested in. It happens. However, as the sun disappeared, I began hearing distant cracks of thunder moving in from the west. I decided to stay put for awhile, and boy did that decision pay off. I retreated from the top floor of the parking garage to the second-to-the-top floor, because it seemed safer (I don't know if it actually was), then I aimed my camera at the skyline. With digital photography, taking photo after photo and hoping you get a lightning strike is a viable strategy, and that's what I did for the next hour. 16 lightning bolts on the Boston skyline. A single three second exposure. One simultaneous strike. The first shot wasn't once-in-a-lifetime. This was. Knowing what I had, this sparked a whirlwind of activity. I uploaded it to flickr and posted it to a bunch of Boston-area photo groups. It was featured as the (now-defunct) bostonist.com photo of the day the following Monday. It was my first photo to make flickr's explore page, which lists the 500 most popular photos of the day. To this day it is still my most-viewed photo on that platform: as of this writing it has over 11000. I also submitted the photo to the Photographer's Forum spring contest in 2009, where it was a finalist. It was published in the book "Best of Photography 2009," a book I never ended up buying because I was in college and it cost $70 (and 1600 other photos made it in there, so it wasn't exactly the most prestigious thing in the world). It's below a giant elephant, it's too small to see all of the lightning strikes, and not small enough to see the lens flare that I didn't photoshop out, but it doesn't matter. That's my name in National Geographic, next to the photo I took 10 years ago today.